Cali, a mini horse has become Mona Ramouni’s guiding light in life. Mona Ramouni’s parents are highly religious and feel that dogs are unclean. This has been a real problem for Mona, because she is blind. Mona became blind after she was born 3 months to old. She has corrected that problem by saving up for three years to buy a mini horse named Cali. The tiny horse is her eyes in the world. She is just 2 feet 6 inches tall and has been trained to help Mona in and out of vehicles, guide her in crowds and patiently wait indoors for Mona when she attends classes or goes to work. Mona found Cali online when she saw a website about guide horses back in 2008. She has been saving for three years to have Cali come and join her in Dearborn Michigan. Mona continues to say that before Cali she thought her life was over, that she wouldn’t be able to get anything out of her life; now with Cali she has the confidence back. 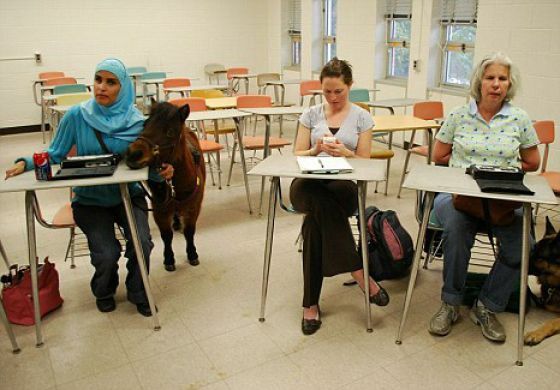 Mona works as a proofreader of Braille textbooks and is just one of only five people in the United States who currently has a guide horse. Learn Something Fun: An international Poll by the Discovery Channel showed that 27% of respondents would prefer a Guide Horse if they required a guide animal. "when she saw a website about guide horses back in 2008"... Ummm, might want to rephrase that. I wondered about that also, and I assumed that she uses dragon software or another program that reads the web to her. "Mona Ramouni’s parents are highly religious and feel that dogs are unclean." How clever that they could teach a pony to read Braille! Dogs are unclean. But it's ok to stone women to death because she is in love with somebody non-islamic. "This comes from people who beat their wives"
"bath maybe once a week"
"wipe their asses with their bare hand"
we have to be totally clean to pray to God and we pray five times a day ! "it's ok to stone women to death because she is in love with somebody non-islamic"
What ... where ... when ... ?